A two Judge Bench of the Supreme Court on Thursday held that Section 45(1) of the Prevention of Money Laundering Act, 2002, insofar as it imposes two further conditions for release on bail, is unconstitutional as it violates Articles 14 and 21 of the Constitution of India. 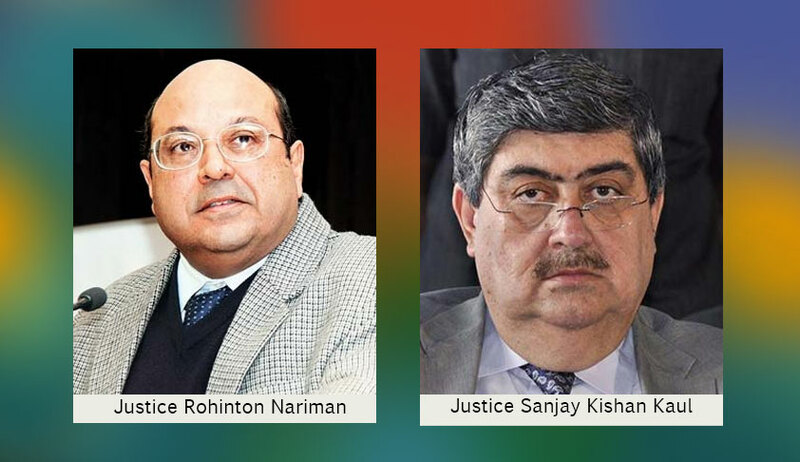 The Bench of Justices RF Nariman and SK Kaul was hearing writ petitions and appeals which challenged the constitutional validity of Section 45 of the Prevention of Money Laundering Act, 2002. Section 45(1) imposes two conditions for grant of bail where an offence punishable for a term of imprisonment of more than 3 years under Part A of the Schedule to the Act is involved. The conditions are that the Public Prosecutor must be given an opportunity to oppose any application for release on bail and the Court must be satisfied, where the Public Prosecutor opposes the application, that there are reasonable grounds for believing that the accused is not guilty of such offence, and that he is not likely to commit any offence while on bail. The bench directed that all the in which bail has been denied, because of the presence of the twin conditions contained in Section 45, will now go back to the respective Courts which denied bail. “All such orders are set aside, and the cases remanded to the respective Courts to be heard on merits, without application of the twin conditions contained in Section 45 of the 2002 Act. Considering that persons are languishing in jail and that personal liberty is involved, all these matters are to be taken up at the earliest by the respective Courts for fresh decision”.